How hard is your water working? Working water is the water used daily throughout your home for cleaning, doing laundry, washing dishes and showering. No matter what, all water is being treated either chemically or mechanically or both. Chemical treatments are the array of soaps and detergents, body washes and shaving creams, and shampoos and conditioners on the market. Mechanical treatment is equipment installed in a home to treat particular water concerns. How hard does water work? Were you thinking, water doesn’t work, it just comes out of a faucet? Actually, it does work. However, its ability to work depends on your water’s actual hardness. Hard water is everywhere. 85% of the water in the United States is hard according to a U.S. Geological Survey. 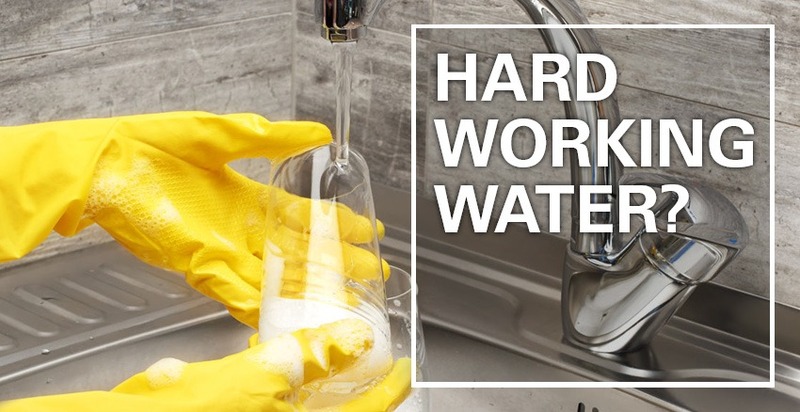 Dissolved minerals like calcium, magnesium, manganese, and iron are what make the water in your home hard, and both city water and well water can have hardness. One of the easiest ways to tell if your water is hard is by the interaction between it and soap. The calcium and magnesium ions in hard water react with fatty acids in soap to form insoluble lime soaps, which is a name for the curd that forms when hard water and soap interact. Maybe you’ve seen that curd floating in your tub water or sink? Showering and bathing. When soaps react with hard water a scum and lime scale deposit are left behind, not only in your tub or shower, but also on your body and in your hair. As well, it takes much more soap to make any kind of lather, because the chemicals in soap that clean are greatly inhibited in hard water.. Cleaning. Hard water will leave you chasing that ring around the tub. It will also impact your washing machine and the clothes coming out of it. Remember detergent is soap too and its effectiveness too is hampered by hard water. Hard water means you will have to use considerably more detergent but your clothes may not be getting completely clean because hard water prevents detergent from converting into a fully effective cleaning solution. In turn, a white chalky residue may stick to the fabric, which is sometimes referred to as detergent curd. The result is dingy looking clothes that don’t feel clean after they come out of the dryer. Hard water can also affect the way laundry feels against your skin due to the mineral build up from hard water that can leave your towels and sheets scratchy and stiff. Cooking. Cooking with hard water can leave deposits on pots, pans, and dishes through the evaporation of hard water when boiling or baking. These deposits can ruin cookware over time. And, do you really want to cook your food in the same water that leaves your laundry stiff and scum in your tub? Energy consumption. For gas water heater, every 5 grains per gallon of hardness causes and 8% loss in efficiency, and an 8% increase in cost when using 100 gallons of hot water per day. When you have hard water, most of the detergent you use ends up being used to soften the water. This means you will need to use way more laundry detergent and hotter water to clean your clothes. But more detergent means greater residue, so it’s a vicious cycle. Soaps for bathing and for the dishwasher act in the same way; more is needed and greater residue may be left behind. All of this additional soap and the hard water itself does affect how hard your water is working. Think of the pipes it must travel through to reach the tap. Hard water creates a build up on the inside of those plumbing lines. The water may have to eventually work harder and harder to pass through. And, hard water affects your appliances, like your washing machine and your dishwasher, causing them to work harder. Hard water can be treated with a water softener. Water softeners deactivate the minerals that cause hardness and increases consumption of soaps, detergents, and shampoos. A softener will leave you with something money can’t buy: time. You won’t be spending excess time and energy cleaning what hard water leaves behind. One last point to address is that mechanical treatment of water dramatically reduces our carbon footprint on the planet. Think of all the chemicals and wastes produced in voluminous quantities seeping into the land and plants throughout the United States alone. Again, this is something money can’t fix without our efforts to do so. The team at Gordon Brothers Water are experts in the water industry. If you would like to know the exact hardness of your water, call to schedule a free in-home water analysis. Also, our Facebook page lists the dates, times, and locations we will be on site at various Home Depots to talk to you about your water concerns and set up that free in-home water analysis. Don’t let hard water be an issue. There is a customizable solution that’s right for you.